Dane Clark (born Bernard Zanville, February 26, 1912 – September 11, 1998) was an American character actor who was known for playing, as he labeled himself, "Joe Average". Clark was born in Brooklyn, New York, the son of Jewish immigrants - Samuel, a sporting goods store owner, and his wife, Rose. His actual date of birth is a matter of some dispute among different sources. He graduated from Cornell University in 1926 and earned a law degree in 1928 at St. John's University School of Law in Queens, New York. During the Great Depression, he worked as a professional boxer, minor league baseball player, construction worker, and in modeling, among others. Clark's early acting experience included work with the Group Theatre in New York City. He progressed from small Broadway parts to larger ones, eventually taking over the role of George from Wallace Ford in the 1937 production of Of Mice and Men. His other Broadway credits include Mike Downstairs (1968), A Thousand Clowns (1962), Fragile Fox (1954), The Number (1951), Dead End (1935), Waiting For Lefty (1935), Till the Day I Die (1935), and Panic (1935). Clark's first film was The Pride of the Yankees (1942). He had an uncredited bit in The Glass Key (1942) at Paramount. Clark got his big break when he was signed by Warner Bros. in 1943. He worked alongside some of his era's biggest stars, often in war movies such as Action in the North Atlantic (1943), his breakthrough part, opposite Humphrey Bogart. According to Clark, Bogart gave him his stage name. Hollywood newspaper columnist Louella Parsons wrote in 1942 that Warner Bros. first changed his name to Zane Clark but then decided on Dane Clark because "Too many confused Zane Clark with Jane Clark." He was third billed in Destination Tokyo (1943) beneath Cary Grant and John Garfield, and in The Very Thought of You (1944) with Dennis Morgan and Eleanor Parker. He had one of the leads in Hollywood Canteen (1944), playing an actual role while most Warners stars made cameo appearances as themselves. Clark had the lead in the 1944 short film I Won't Play with Janis Paige, which received the 1945 Academy Award for Best Short Subject (Two-Reel). Clark supported Morgan in God Is My Co-Pilot (1945) and Garfield in Pride of the Marines (1945). Exhibitors voted Clark the 16th most popular star at the US box office in 1945. Clark supported Bette Davis and Glenn Ford in A Stolen Life (1946) and was promoted to top billing for Her Kind of Man (1946), a crime film. He followed it with That Way with Women (1947), Deep Valley (1947), and Embraceable You (1948). Republic Pictures borrowed him to play the lead for Frank Borzage in Moonrise (1948). At Warner Bros., he was in Whiplash (1948). Clark went to United Artists for Without Honor (1948), then back to Warner Bros. for Backfire (1950) and Barricade (1950). He travelled to England to make Highly Dangerous (1950) and France for Gunman in the Streets (1951). Back at Columbia he was in Never Trust a Gambler (1951). He acted in the United Artists Western Fort Defiance (1951). He went back to Britain for The Gambler and the Lady (1953), Murder by Proxy (1954) and Five Days (1955), all for Hammer Films. In the US, he was in Go Man Go (1954) with the Harlem Globetrotters and Toughest Man Alive (1955). During the 1950s, he became one of a small group of actors (excluding the original 'founding' members brought in at the Studio's inception) awarded life membership in The Actors Studio. Clark played Peter Chambers in the short-lived radio program Crime and Peter Chambers, a half-hour show which aired from April 6 to September 7, 1954. Clark first appeared on television in the late 1940s, and after the mid-1950s worked much more in that medium than in feature films. In the 1954-1955 season, he co-starred as the character Richard Adams, with Gary Merrill in the role of Jason Tyler, in the NBC crime drama Justice, about attorneys of the Legal Aid Society of New York. In 1955 he was acting on stage when the female he was acting against actually died in his arms. He went back to films for The Man Is Armed (1956) and Outlaw's Son (1957). 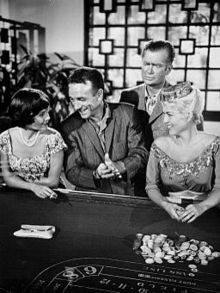 In 1959, he reprised Humphrey Bogart's role as Slate in Bold Venture, a short-lived television series. He also guest starred on a number of television shows, including Faye Emerson's Wonderful Town, Appointment with Adventure, CBS's Rawhide in the episode "Incident of the Night Visitor", and The Twilight Zone, in the episode "The Prime Mover". In 1970, he guest-starred in an episode of The Silent Force and had a role in The McMasters (1970). He also played Lieutenant Tragg in the short-lived revival of the Perry Mason television series in 1973, and appeared in the 1976 miniseries Once an Eagle. Clark was married twice: firstly, to Margot Yoder, a painter, from 1941 until her death in 1970; and secondly, to Geraldine Frank, a former model, stockbroker, and real estate associate broker, from 1971 until his death in 1998. Clark died on September 11, 1998, of lung cancer at St. John's Hospital in Santa Monica, California. His remains were cremated and his ashes given to his widow. 1942 Suspense Tom Cochrane in "The Singing Walls", airdate September 2, 1943. 1943 Suspense Walter Bates in "Life Ends at Midnight", airdate February 17, 1944. 1945 Suspense Joe Jordan in "This Will Kill You," airdate August 23, 1945. 1951 The Big Show Guest Appearance, airdate November 25, 1951. ^ a b c d e Lawrence Van Gelder (September 16, 1998). "Dane Clark, Actor, 85, Dies; Starred in World War II Films". The New York Times. Retrieved 2008-05-25. ^ Adams, Marjory (September 13, 1943). "Movie Question Box". The Boston Globe. Massachusetts, Boston. p. 7. Retrieved August 3, 2018 – via Newspapers.com. ^ Social Security Death Index for Dane Clark, Social Security No. 067-05-7928, accessed via Ancestry.com on Feb. 4, 2010. ^ The three most frequently shown dates are February 26, 1912; February 18, 1913; and February 18, 1915. The Social Security Death Index shows the 1912 date. Age listings consistent with a 1912 birthdate are also found in border crossing information available on Ancestry.com, and 1930 census records. The 1920 census listing is consistent with a 1913 birth date. ^ Keim, Norman O.; Marc, David (2008). Our Movie Houses: A History of Film & Cinematic Innovation in Central New York. Syracuse University Press. p. 105. ISBN 9780815608967. Retrieved 3 August 2018. ^ Pollock, Arthur (March 27, 1935). "The Theater". The Brooklyn Daily Eagle. New York, Brooklyn. p. 12. Retrieved August 3, 2018 – via Newspapers.com. ^ "Dane Clark". Internet Broadway Database. The Broadway League. Archived from the original on 3 August 2018. Retrieved 3 August 2018. ^ Parsons, Louella O. (November 19, 1942). "Cheryl Walker, Rose Bowl Queen Of 1938, Gets Stage Door Canteen Lead". The Fresno Bee The Republican. California, Fresno. International News Service. p. 16. Retrieved August 3, 2018 – via Newspapers.com. ^ "The 17th Academy Awards: 1945". Academy of Motion Picture Arts and Sciences. ^ "Bing Crosby Again Box-Office Leader: Van Johnson Second In Film Poll Of Exhibitors--Rogers Wins For Westerns". The New York Times. December 28, 1945. ^ Garfield, David (1980). "Strasberg Takes Over: 1951-1955". A Player's Place: The Story of The Actors Studio. New York: MacMillan Publishing Co., Inc. p. 93. ISBN 0-02-542650-8. Aside from the original Robert Lewis group and those who came in with Mann and Meisner and were asked to remain, being such individuals as Roscoe Lee Browne, Dane Clark, Tamra Daykarhanova, Rita Gam, Burgess Meredith, Sidney Poitier, Paula Strasberg, Anna Mizrahi Strasberg, and Franchot Tone have been voted directly into membership by the Studio's directorate or by Strasberg himself. In the early sixties, several actors who performed with The Actors Studio Theatre were similarly admitted. ^ Terrace, Vincent (1999). Radio Programs, 1924-1984: A Catalog of More Than 1800 Shows. McFarland & Company, Inc. p. 85. ISBN 978-0-7864-4513-4. ^ Edward J. Boyer (September 15, 1998). "Dane Clark; Theater and Television Actor". The Los Angeles Times. Retrieved 2016-04-29. ^ Wilson, Scott (September 16, 2016). Resting Places: The Burial Sites of More Than 14,000 Famous Persons, 3d ed. McFarland. p. 137. ISBN 9781476625997. ^ "Escape and Suspense! : Suspense - This Will Kill You". www.escape-suspense.com. Wikimedia Commons has media related to Dane Clark.